The green pulp fruit comes from the Persea Americana, a tree native to Central America, and presents different varieties in color and shape and sizes. Avocados are rich in Vitamins (K, C, B5, B6 and E), Folate and Potassium. This mix of richness is enclosed in about 160 calories per 100 grams of fruit. It also has about 2 grams of protein, rich in fibers and with 15 grams of healthy fats; it’s very low in saturated fats. Avocados are richer than bananas in the percentage of potassium you can get. And that is about 14% of the daily dose of this important mineral with 100 grams of this fruit. Potassium is one of the essential macrominerals and it’s responsible for the maintenance of activity of the heart and muscles, protection against muscle mass loss and preservation of bone density. The monounsaturated fatty acids present include oleic acid that has been linked to the ability to reduce inflammation and cancer preventing benefits. Cut each avocado in half, remove the pit, and scoop out the flesh into a bowl. Add the lemon juice and salt. 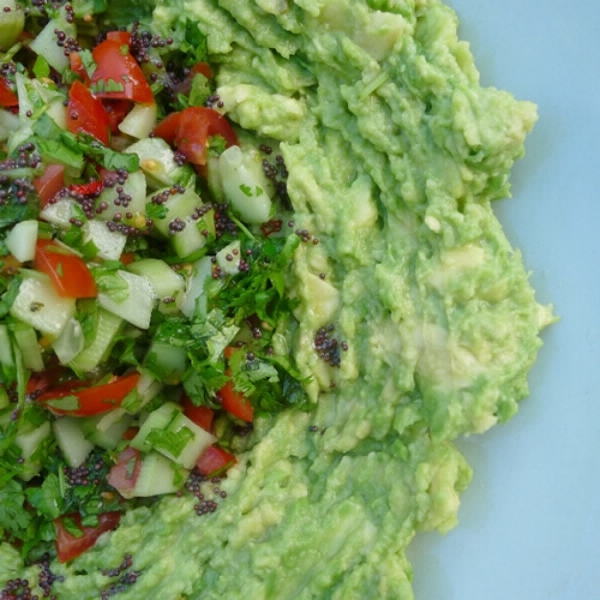 Mash the avocados a bit with a fork, or for big quantities a potato masher works well. Don’t overdo it – you want the mixture to be quite chunky. Set aside. Chop the tomatoes into small pieces. Finely chop the fresh coriander and mint and then add to the tomatoes in a small bowl, combining until evenly mixed. Add salt and pepper to taste, and squeeze generously with lemon. Place the avocado mixture on a flat plate. Using a spoon, create a hole in the center for the tomato salsa to sit in. Scoop the tomato salsa into the center of the plate. Heat the ghee in a small pan. When hot, add the mustard seeds and if using, the finely chopped chilli. When the mustard seeds start to spatter and pop turn off the heat and pour it over the tomato salsa. Sprinkle with the lemon zest. Enjoy with crackers or slices of your favorite bread.